Pushing aside the Pixar standards that have become the all-too-entrenched de facto metrics for measuring the worth of anything considering itself a “children’s film,” Winnie The Pooh proves that you don’t have to slide in humor geared for adults or push blockbuster scale to make a great family film. Instead, Winnie The Pooh strives to be every inch a children’s film that finds its own path to quality by never being cheap, and staying true to character and clear morals. It’s easy to imagine the Winnie the Pooh cash-in that has the characters crashing through a portal out of the 100 Acre Wood and into the real world. It’s shamefully easy to conceive of their cheap CGI forms bumbling about a grocery store or riding a careening skateboard attached to the car of some comedian or another that’s finally getting to cash in. Fortunately though, Disney knows the value of Pooh is as an old-fashioned warm tael tale of adventure and imagination, with only the lushly rendered forest backdrop and occasional interaction with the storybook itself necessary for a good time. Pooh wakes up hungry for honey, but is sidetracked by a search for Eeyore’s tail. Soon it becomes clear that Cristopher Robin has been kidnapped by a frightful “Backson” creature, and adventure ensues. Simple and clean. Clocking in at 68 minutes the film doesn’t overstay its welcome (or short attention spans) and mixes up even that brief runtime with several songs and a sequence told in chalk animation. 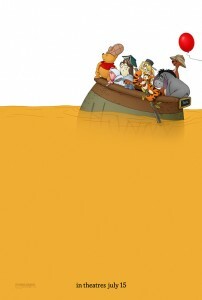 While it’s obviously Pooh’s show, the other characters get their time in the spotlight, especially Tigger and Eeyore. Bringing in likes of Tom Kenny, Craig Ferguson, and Jon Cleese means the film will have a few familiar voices for film fans, but none of them try and fix something that isn’t broken, each doing their best by the character. Zooey Deschanel lends a sweet voice to Pooh’s theme, while Henry Jackman ensures every note of Pooh is exciting and sweet. Make no mistake, this is a movie squarely aimed at very young children, with the gentle feel of imagery geared for those just learning or looking forward to learning to read. The satisfaction an older viewer will find is from the genuinely clever puns and character-based silliness that they can laugh at with their children- a much nicer feeling than waiting for the next joke aimed over the children’s heads that will land with you. It’s a shame more films like this aren’t made, as most theatrically released movies aimed at the very young represent the stupidest, cheesiest efforts imaginable. Pooh earns his place on the big screen by reminding us that imagination and friendship are worth more than another blustering action scene, while landscapes and characters that carry with them the soul of those who drew them can be just as visually dazzling as the most photoaccurate algorithmic assortment of pixels. He might not be everyone’s cup of tea, but this movie helps ensure Pooh will retain his rightful place among the most enduring of children’s icons. I will say though, it would be nice to see Pooh give reading for himself a shot! Renn’s on twitter, he checks the comments, and keeps up with the boards- check in somewhere!